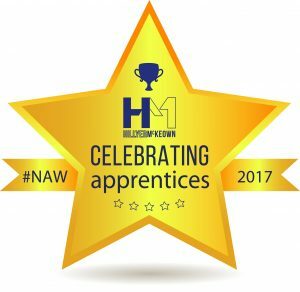 Hillyer McKeown is proud of its apprentices and the contribution they make to our business. As part of the celebrations, we are sharing information about the benefits to us and the economy as a whole. The National Apprenticeship Service (NAS) highlights how apprenticeships can offer a brighter future to the people learning, and the benefits to businesses which take part in traineeship programs. 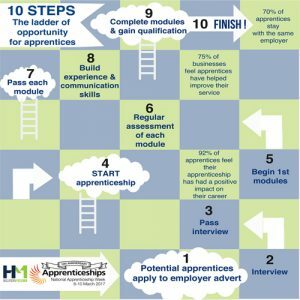 Apprentices are able to step on the first rung of the ladder to improved career prospects. Progress in some instances includes reaching Higher and Degree apprenticeships. And the initiative is clearly working as 83% of apprentices said their prospects had improved. Apprenticeships are not just about gaining practical skills as those completing a higher apprenticeship could see a boost in earnings of an estimated £150,000 over their lifetime. It may surprise you to learn that 90% of apprentices stay in employment after finishing an apprenticeship. Of these, 71% stay with the same employer meaning offering apprenticeships can be a real investment for a business, bringing new skills into the workforce. Apprenticeships offer opportunities for learning skills, training and development, and improved prospects and financial gain. Job satisfaction is high (at 89%) and can be a ladder into further education. Apprenticeships allow companies to boost their skills base to bring increased profits, lower prices and better products. On average, apprenticeships boost productivity in businesses by £214 per week! The pathway to gaining practical skills has been taken up by over 620,000 apprentice since 2015. Across the scheme apprenticeships are available in 1,500 job roles over 170 industries. The NAS supports the delivery of apprenticeships and traineeships in England. Search for over 28,000 quality apprenticeships at any one time. I decided to leave school and start an apprenticeship as it’s a great way to gain qualifications and earn money while learning on the job. It has given me nearly 2 years experience which is highly desirable within the workplace and I have learnt valuable skills which I would not have gained if I had stayed in full time education. After completing my apprenticeship, I’ve had the opportunity to move on and progress into another department within the firm. Read Rhiannon’s story A day in my life as an Articled Legal Apprentice. 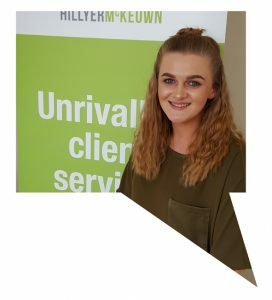 I’m currently an apprentice at Hillyer McKeown. To find out why I decided to do an apprenticeship, what my own experience has been like and what I hope to achieve when I finish, here’s a short interview. Hear first hand some of the skills and experience our apprentices have gained by doing an apprenticeship, and what they want to do next. Our Business Administration Apprenticeships last 12 months and we are pleased to say that after completing their apprenticeship, 100% of our apprentices have progressed to become full time employees. Our number of apprenticeship places varies, and can be up to four in one year. 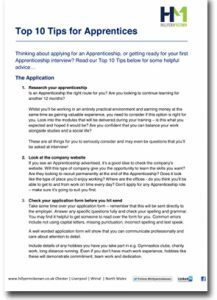 At first apprentices are based in the administration department where they receive support and guidance to gain experience. During the year there are mandatory and optional qualification units which cover key skills and help build experience for working in business. And it’s not all about administration skills, some of our apprentices are also involved in shaping how Hillyer McKeown is developing. This includes making valuable contributions to our employee engagement committee and helping to organise office events. Watch videos on YouTube, Facebook and Instagram. Are you an employer looking to recruit an apprentice for the first time or to expand your support? The NAS offers free impartial advice. Follow the NAS on LinkedIn and Twitter.